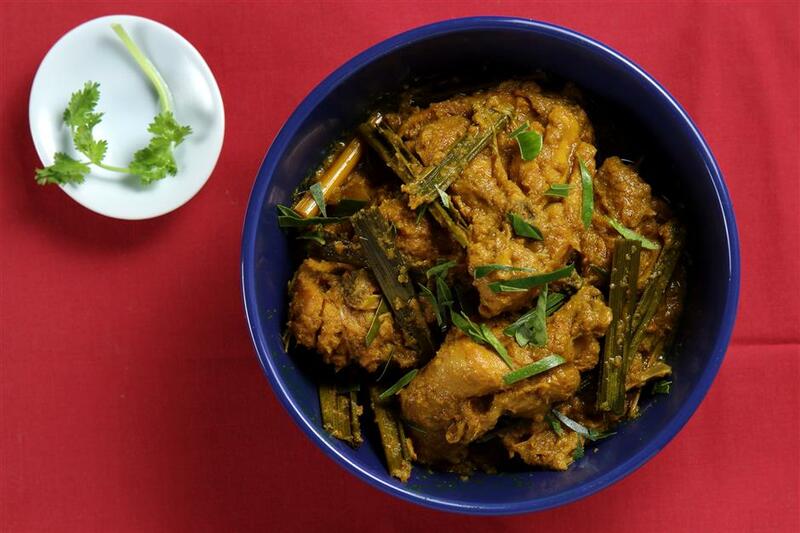 Joyce Siow’s Tumeric chicken recipe, an Asian delight full with spices and aroma. Thanks, I’m so glad to find this recipe, will definitely make it next week. Yummy! I am interested in trying out this recipe but we do not get fresh turmeric here in Sydney. Can I substitute with turmeric powder? If so how many tea spooons of turmeric should I use? Any Asian shop which sells screwpine leaves and lemongrass will have it. U can also add tumeric leaves sliced finely …. Dry turmeric powder is better than fresh turmeric. Fresh Turmeric may have very strong smell and it may spoil the curry taste. Dry turmeric powder is better. Most of the dry tumeric powder that you get is a blend of tumeric and something else. As someone whos been making this dish over the years with both dry and fresh tumeric, fresh tumeric wins hands down every single time. There is such a stark difference between using powder and fresh tumeric. Tumeric powder produces an uninteresting flat flavor while fresh tumeric gives the dish more depth and robustness that tumeric powder can NEVER achieve. You can get the fresh tumeric from Asian stores and then plant them like how you plant ginger. Plant them in late winter or early Spring and harvest early fall. John, fresh tumeric is easily available in most Asian grocers in Sydney together with most Asian herbs like Thai basil, lemongrass and pandan. I’ve also seen it at IGAs. Good luck with your search. Fresh herbs will open up a new world of flavours that dried herbs just can’t duplicate. You can get fresh tumeric from fresh fruits and vegie shop in Sydney. I believe this dish should be tagged under Malay cuisine. The ingredients are endemic to Malay Indonesian Cooking. Is it not enough that it was tagged under “MALAYSIAN” cuisine? What difference does it make? Tumeric, lemongrass, shallot, peppercorn, screwpine leaf are used widely in asian cuusine like Thailand, Vietnam , Cambodia, Indonesia and more. Its not Malay.cuisine but a Nyonya cuisine transcends from two culture, Chinese and Malay. Its a simple dish Penang folks cook often for the family. True. Nyonya dish which my melaka nyonya mum cooked often when I was young. I love the dish. This is so delicious and I have been cooking this dish EVERYDAY now. Well, that’s the perk of living alone. I made this last weekend and it was pretty good. Just wondering… the picture shows two types of leaves, but there is only one in the recipe (pandan). Is the other one bits of the lemongrass? Lime leaves? I put in some oyster sauce as well to give it better flavoring . I just cooked this, it smells very good of pandan. I used my homemade turmeric powder, made from all 100% turmeric from my garden 🙂 I agree the turmeric powder from stores do not taste good and mostly added wtih fillers. This is not a Malay dish, it’s nyonya and so are many of the ‘kuih-muih’. They are all Nyonya kuih, I ‘m not a Nyonya but don’t like when others claim what’s not theirs lol !